Biomechanical forces generated by fluid flow regulate endothelial cell biology in vascular transport systems. Several lines of evidence indicate that disturbed flow in blood vessels corresponds with vascular disease and dysregulated endothelial cell turnover; however, flow-dependent effects on endothelial cells in the lymphatic vasculature have not been well defined. Amélie Sabine and colleagues of the University of Lausanne determined that the transcription factor FOXC2 maintains normal lymphatic endothelial cell morphology and vascular integrity during disturbed flow. FOXC2 was highly expressed in cultured lymphatic endothelial cells (LECs) exposed to disturbed flow, in contrast to cells exposed to static conditions. Under conditions of oscillatory disturbed flow, FOXC2-deficient LECs exhibited an abnormal shear stress response, resulting in aberrant intercellular junctions caused by increased contraction of actin stress fibers. Loss of FOXC2 also induced excessive LEC proliferation due to loss of FOXC2-mediated suppression of the transcriptional co-activator TAZ. In murine models, induction of LEC-specific Foxc2 deletion resulted in loss of vessel integrity and consequent lymph leakage, lymphatic valve degeneration, and mortality. Together, these results provide important insight into how lymph flow regulates LEC biology. Moreover, as FOXC2 mutations underlie lymphedema-distichiasis, a human disease of the lymphatic vasculature, this study provides a mouse model that may facilitate further studies into the pathogenesis of this disease. 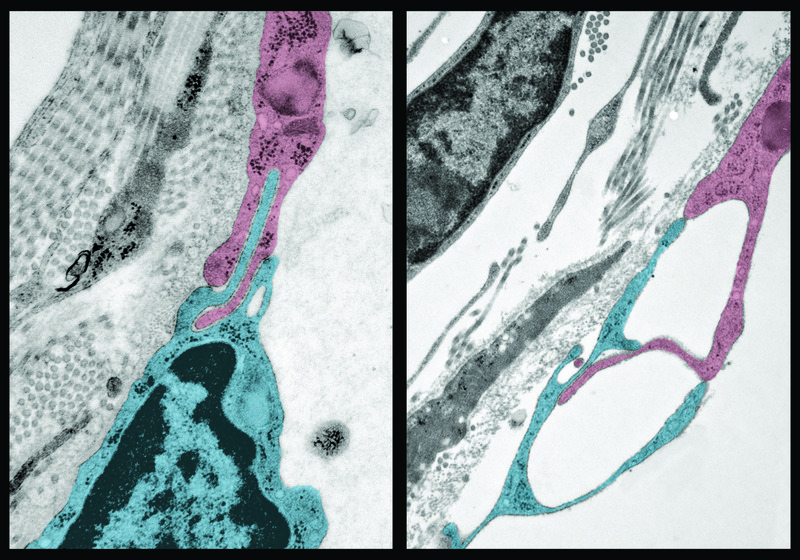 The accompanying false-colored electron micrographs show LEC junctions in the thoracic duct of WT (left) mice and mice with induced deletion of Foxc2 in LECs (right). Note the disruption of the endothelium and the formation of a large vacuolar structure in the mutant animals. Moreover, the “interdigitating” contacts between neighboring cells (pseudo-colored pink and blue) observed in the WT animals are lost in the mutant animals. Citation Information: J Clin Invest. 2015;125(10):3861-3877. https://doi.org/10.1172/JCI80454. Biomechanical forces, such as fluid shear stress, govern multiple aspects of endothelial cell biology. In blood vessels, disturbed flow is associated with vascular diseases, such as atherosclerosis, and promotes endothelial cell proliferation and apoptosis. Here, we identified an important role for disturbed flow in lymphatic vessels, in which it cooperates with the transcription factor FOXC2 to ensure lifelong stability of the lymphatic vasculature. In cultured lymphatic endothelial cells, FOXC2 inactivation conferred abnormal shear stress sensing, promoting junction disassembly and entry into the cell cycle. Loss of FOXC2-dependent quiescence was mediated by the Hippo pathway transcriptional coactivator TAZ and, ultimately, led to cell death. In murine models, inducible deletion of Foxc2 within the lymphatic vasculature led to cell-cell junction defects, regression of valves, and focal vascular lumen collapse, which triggered generalized lymphatic vascular dysfunction and lethality. Together, our work describes a fundamental mechanism by which FOXC2 and oscillatory shear stress maintain lymphatic endothelial cell quiescence through intercellular junction and cytoskeleton stabilization and provides an essential link between biomechanical forces and endothelial cell identity that is necessary for postnatal vessel homeostasis. As FOXC2 is mutated in lymphedema-distichiasis syndrome, our data also underscore the role of impaired mechanotransduction in the pathology of this hereditary human disease.